As office cleaners in Sydney, we deal with and dispose of office waste on a daily basis. According to a 2013 report, Australians generate 2.2 tonnes of waste per capita and a large percentage of this waste goes straight to our landfills which will continue to pollute our environment for years to come. By implementing a just a few of the simple measures listed below, you will be able to not only aid the environment and more pleasant place to work. In addition, you’ll be able to save your business some money by cutting down on costs associated with office consumables (paper, printer ink etc) and cleaning services. Cut the amount of paper you go through in half by switching to double sided printing. 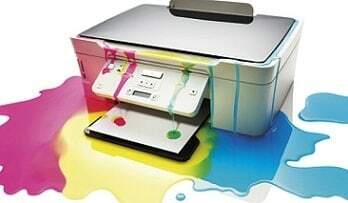 Most modern printers now support this feature and you should really consider upgrading if your current printer. You’d be saving money in the long run since printer prices these days are usually nowhere near the accumulated cost in consumables which would be used during the lifetime of the printer. Colored ink tends to be expensive and inefficient and if you open up your color printer cartridge, you’ll likely find that it consists of 3 colors (red, blue, yellow). The main issue with this is that you usually need to replace the entire cartridge once 1 of the 3 colors runs out even if the 2 still has ink remaining. This is great for printer ink manufacturers but results in unnecessary wastage and additional rubbish being sent to landfills. Try to print in documents in black and white whenever possible and save the color printing for those rare occasions when it’s absolutely necessary. Inkjet printers may be cheaper to purchase initially but will end up costing a fortune in consumables in addition to the large amount of waste when ink cartridges are disposed of. Modern laser printers are a much better option and will significantly reduce both ink costs and waste, as the toner they use is far more efficient. While you don’t want documents to be so dense with text to the point of being difficult to read, you also don’t want to waste the space available on a sheet of paper as this results in more paper being used. Take a look at your page margins and paragraph spacing and consider whether that white space is actually needed. Paper memos can add a lot of clutter to an office. Look at sending your memos via email or some other digital messaging system. This has the added advantage of allowing you to more easily target the groups and individuals that are the intended audience of those memos. You can reduce a great deal of office clutter by using digital documents such as PDFs instead of physical copies. Software such as adobe reader XI even allows you to sign contract electronically. This has the added benefit of having documents which are stored digitally on your hard drive or cloud network which reduces clutter and saves actual storage space. You are well on your way to a more environmentally friendly office by implementing these simple procedures. 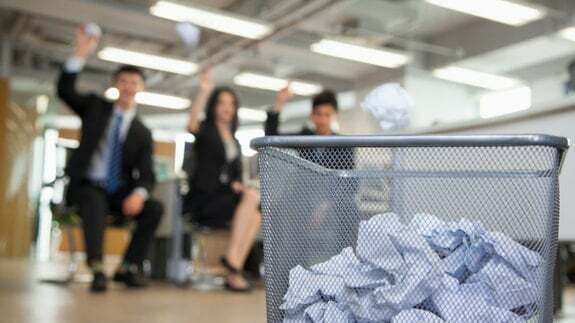 Hire a professional office cleaning service to deal with any remaining office waste.